As marketers by trade, we see a whole lot of Facebook ad examples on a daily basis. We’re cookied on nearly every website you could imagine, and we’re always on the hunt for the best tactics to use in our own Facebook advertisements. In the past, we’ve always screenshotted the best Facebook ads we’ve seen when scrolling through our News Feed or Instagram. Cambridge Analytica brought a whole slew of negative press to Facebook. As marketers, we’ve seen a wide array of changes come to the platform — new processes for ad review and approval, easier to understand privacy settings, and regulations on certain ad types (like political messages). Basically, it means that now, you’re able to spy on your competitors’ ads a whole lot easier. You simply go to their page, navigate to the info & ads section on the left-hand side of the screen, and go to work! Bonobos does two things really well in this Facebook ad example. First, they directly speak to their targeted male audience. They use the words “you,” “your,” and “you’re” to add a personalized feel to this Facebook ad and to make the viewer feel like as if it’s written directly for them. Next, they do an incredible job of creating a strong brand awareness — showing people that Bonobos clothes are emblematic of a creative and hard-working lifestyle. Bonobos clothing doesn’t make people something, but instead, the brand has the clothes that let you create your own style. The copy, messaging, and well-composed photo all support that brand image. Quip identifies one of the biggest differentiators of their toothbrush from other brands — it helps you brush your teeth the right way — and uses it to create a fun cartoon video ad. Through the copy, they add a bunch of other advantages of their product: it’s simple, affordable, and enjoyable. Then as a final differentiating feature, Quip adds the line “created by dentists and designers” to challenge another potential objection towards their brand. Hubble takes two awesome approaches here. First, they pull a quote from a reputable brand (GQ) to add social proof to why you should buy their contact lenses. But instead of linking to a buy page, they link to a quiz — giving the viewer a sense that the purchase experience is directly personalized. Plus, they incentivize clicking the offer by giving you 15 free pairs of contact lens if you fill out their quiz. Smart move. Everlane plays on the psychological impulses of their viewers to create FOMO with this Facebook ad for their new heels. They use a quote from the popular fashion site Who What Wear alongside the headline, “sold out almost immediately,” to get clicks on the ad. The interesting aspect of this ad is that the image doesn’t show the full heel! It gives you a glimpse of the back of the shoe — but to see the full image, you’ll have to click the link and move one step closer to converting. It’s important to note that Harry’s has a partnership with Target to sell their products in stores, so they communicate that in the subheadline. That way, when a viewer is served with the ad but doesn’t click and purchase, they still might remember Harry’s next time they are at Target (and potentially convert in the store). If you have glasses, you know how annoying it can be to remember to get your prescription updated nearly every year. Warby Parker knows this — and they run an ad to nudge you to download their app to start your renewal process the easy way. They likely are targeting this ad to customers who have purchased Warby Parker frames around a year ago. That way, they can appeal to customers with this price-driven headline. Felix Grey tries out a bold color with this bright orange ad for their eye-strain glasses. Then, they use a quote from Bustle to back up their brand value. With this post, they’re actually pointing their Facebook traffic to a post on Bustle.com. If the post is is positive enough about the brand, and has accurate links to purchase, this can be a great move a D2C brand. This Facebook Carousel ad shoes several variations of the popular Allbirds Wool shoe. The images for the ad are composed with shoes against a white background, but the slightly odd angle of each shoe makes you stop and consider before moving onwards in your Facebook News Feed. Finally, the copy has a powerful headline — and acknowledges many of the biggest benefits of the shoes: Machine washable, free shipping, and free returns. Glossier sells beauty and skincare products online — and one of the biggest channels for that industry is influencer testimonials. So for their exfoliating skin perfector, Glossier runs a Facebook video ad of the product being applied. Watching their ad is like going into the makeup section at the department store, except this time, you don’t have to get off of your couch! The image used in this great Facebook advertisement is spot on. It’s one of the best Facebook ad examples on the list. Here’s why. Away wants to encourage people to embrace wanderlust and then go to their site and buy the suitcase. In this image, they juxtapose 3 of their suitcases next to the ocean. They use different suitcase sizes in shades of red, white, and blue. You can’t help but associate the image with July 4th — and we have a feeling it’s on purpose. Suddenly, you’re transformed from your desk in Manhattan and your brain is reminiscing on summer, the beach, and all that it entails. Casper recently expanded from online-only operations to opening brick and mortar stores around the country. This is an ad to promote those new physical locations. The ad is effective because it’s directly targeted to an audience in a particular geographic area, in this case, Miami. In the copy, Casper asks a lot of questions that make you feel as if the ad is directly personalized for you. The tone of the supporting copy is playful, and even cracks some tasteful jokes. Then below, they include a couple napping in their sheets. The bedding’s white palette makes the product seem cool and comfortable. This is a great job on creating a feeling through one of the best Facebook ad examples we’ve seen. Another ad that plays on FOMO. Note that M. Gemi says nothing about these shoes currently being sold out. But since you know that it happened once in the past, it could very well happen again. Nonetheless, you’re inclined to move quickly and not miss the deal. This MeUndies Facebook ad example talks directly to the audience — telling viewers “these are the Undies you’re looking for.” As a retargeting ad, this is an effective way to bring an item back in front of a site visitor and encourage them to take that final conversion step. This Facebook ad example from Outdoor Voices uses past customer quotes to communicate their products. It’s a simple, yet powerful tactic that any brand can use — from e-Commerce to Software and beyond. This Cotopaxi ad is for one of their “one of a kind” packs. The copy is direct when describing the backpack, but it also highlights two other benefits from the brand: free shipping and free returns. Frank and Oak offers a clothing subscription service, and to promote their offering, they use a headline from CNN beside their ad to install credibility to their service. Then on top of the video ad, they add an overlay with a customer quote. This is a great example of using the real estate available to you that is often forgotten. This Facebook ad example from Framebridge presents visitors with a coupon code to use on their next purchase on the site. By retargeting past customers, Framebridge is able to use this Facebook ad to increase LTV and present an offer that is hard to pass up. Leesa is one of the many mattress-in-a-box brands. And how do they appeal to new customers and differentiate from Casper, Helix, and Tuft & Needle? Selling 300,000 mattresses is no easy feat — and Leesa knows it. They effectively use the stat as marketing fodder in this Facebook ad. We also appreciate how Leesa uses a coupon code and a playful emoji to give that extra nudge for visitors to click the ad. We like the idea behind this advertisement a lot. It’s similar to the method utilized by Coors Light when marketing their beer. They don’t sell beer, they sell cold beer. Here, Helix isn’t selling a normal mattress, they are selling a mattress that keeps you cool. Starting their video with a mountain adds an element of curiosity that you can’t help but click. We like this ad for the actual looping video of a stool going up and down that commences once you click play. Houzz offers a variety of products, but this “Elevate your style” Facebook ad campaign does a great job of appealing to customers particularly interested in purchasing a new bar stool. 1stdibs is a high-end marketplace for furniture, jewelry, and art. But rather than serving an ad for each individual item, they are using content about high-end homes to get an audience to visit their site. We appreciate how they know their brand; they use this listicle to drive traffic, and then later encourage visitors once on their site to interact with specific items. Feather is a startup that offers rental furniture from top brands — such as West Elm, Joybird, Casper. Their ad does a great job of juxtaposing these brand names next to an image of a woman relaxing on furniture with her dog. Facebook carousel ads are great for featuring multiple variations of your product. Here’s a fun advertisement that combines two successful conversion techniques — including a quote from a popular site (Apartment Therapy) and stringing images together into a series. The result is a sleek and interesting content-powered advertisement for Burrow. Here’s another creative approach from the folks at Floyd. Rather than writing their Facebook ad from the perspective of a narrator, they wrote it from the perspective of their furniture. This wouldn’t work for every brand. But it works well here for Floyd, especially since the name of their company is a first name. Another great example of when a customer quote can be more meaningful than your own words. Bombas uses an enthusiastic customer’s review to add weight to their product. They pair that quote with a stylish photo of their product, a headline that reiterates the quote, and voila, a nearly perfect Facebook ad. Peloton pioneered a new idea in fitness: You can get as good of a workout at home as you can at Soulcycle. This ad provides a great, succinct value prop of why you should visit their site and learn more about their “game-changing” fitness product. Instead of just referencing a press mention, sometimes pulling a quote from a celebrity or influencer is just as powerful. It adds a more personal, human appeal than mentioning a publication. Here, the shoe brand Greats, calls upon a testimonial from celeb chef Bobby Flay for their ad. They then pair the ad with high-quality, carousel images of the shoes in different settings, giving a visual presentation of their product line. J. Crew knows their audience well. In one of the best Facebook ad series we’ve seen, they use a simple, single-photograph and a description of a new, exclusive collection to drive traffic to their site. It’s a bit of a teaser — you can see the clothes in the ad photograph — but to get full details on the collection, you have to visit the J. Crew website. This is an interesting tactic that can work if the site you refer traffic towards converts for your product at a high rate. Rather than sending traffic to their own site, Ritual sends traffic to an article on Buzzfeed about their product. Be cautious with the technique, it works for some brands, but for others, it can be a waste of time and money. This ad from Care/of is another great example of a direct-to-consumer brand using a customer’s quote to market a product. Here’s a great technique — throw out a scary statistic to your audience. Most men don’t want to lose their hair, so leading with “66% of guys lose their hair by age 35” makes even the most full-headed man want to click this ad. Other notable features of this ad include using all lowercase type — a brand decision to match the style of the company name forhims — and a visually intriguing photo of another hand running the forhims product across a head. Keeps is a competitor to Hims — and they take a different approach with this Facebook ad example. Their video uses an illustration rather than a human head. It’s hard to say what ad works better — but if you’re in the position where you have to ask, it might be worth running two iterations — one ad with a cartoon, one with a human. This ad proves the absurdity but necessity of customer quotes. It’s unclear who says they are “super soft” but we can assume it was a customer or a review posted online. Did a customer actually say that? Maybe — but it doesn’t really matter. Including a quote (even if unattributed) is what makes this ad work. Soylent notably did not have any active US Facebook campaigns at the time of this article’s creation. But they were running a targeted ad to UK customers. The result? Soylent makes their British audience feel as if this advertisement is uniquely created for them. This ad is successful because Blue Bottle is able to show the beauty and deliciousness of their coffee in a photo. Who doesn’t want to drink a big glass of cold brew after seeing this ad? Then, the supporting copy provides a few other value points that differentiate their brand from other roasters. Blue Bottle provides the tools to make “beautiful coffee, every morning” by bringing together an expert team, providing great tools, and selling delicious coffee beans. We like this ad a lot because of the headline—The Cole is ready to impress—and the subheadline—Premium materials, from toe to heel. While the ad from Tecovas is a quick message that pops across your Facebook News Feed, but if you’re like us, you’ll be itching to click. Nike runs a lot of ads for a lot of products. To simplify their experience, they seem to run automated product ads with no associated copy. While this is not always a best practice, it can work and save time for a brand like Nike that has robust data to with which they can retarget millions of visitors. Ever wonder how Dollar Shave Club sold for $1+ billion? Well, it’s in part because they are experts in customer acquisition. This Facebook video ad shows exactly why. They hook you with the headline “Hate shaving?” — and then make you want to find out what four steps the brand is referring to with the “Try These 4 Steps” headline as the splash screen of their video. Here’s another example of a coupon-driven advertisement. Birchbox isn’t shy about sharing the code with their audience. They include the coupon code in 3 places: headline, body, and image. One of the biggest obstacles in getting a business to sign up for Square is security. This video ad addresses that pain point and focuses on the security features of the product. Notice how Square mentions their brand name in every part of the ad to make an impression with their audience. The goal is that even if you don’t convert, you’ll be more familiar with the Square brand and associate them with security. Coinbase uses their Facebook ad for Sign Ups for their crypto trading service. The ad mentions all of their various benefits — they are a marketplace for Bitcoin, Ethereum, Litecoin, and more. In terms of creative, the ad does a great job of previewing the Coinbase app on a real phone. It provides a strong blue background which makes the overlaid copy easy to read. Here’s an example of a Facebook ad that uses a giveaway to incentivize users to sign up. Rather than directly pitching people to use Sofi’s service to pay down their student debt, this ad encourages a viewer to sign up for a seemingly free 1:1 career coaching. Then after collecting audience information for this free service, Sofi can more directly pitch their service to ideal customers. Transferwise allows you to transfer money internationally in a super low-cost way. These ads are great because they are extremely personalized — it can make a member of the audience feel as if the ad is directly targeting them (and, you’re right, it likely is). For instance, this ad calls out Dutch people living in the US with the headline “Dutch 🇳🇱in the US 🇺🇸?” It’s direct, and the inclusion of emojis makes it even more enticing of an ad. Then, Transferwise then can send this traffic to a personalized landing page built around USA <> Netherlands transactions. And what’s the best part? This method is scalable! Transferwise can replicate the set for each nation where it operates. Stripe’s customers are companies — more specifically, developers at tech-enabled businesses. This ad calls out developer directly with the headline “built for developers” and provides a quick value prop for them to learn more about what they can do with Stripe. First, it gives a catchy headline up top: “When you buy low, sell high, and don’t have to pay commissions…” Then, the marketers at Robinhood included the money face emoji 🤑at the end to add a silly but relevant playfulness to the ad. In the video for their ad, Robinhood does a wonderful job of including a large number ($1024.52) and upward line to visualize positive returns that can be accomplished on their app. They also add a bizarre black and white background that honestly confused us at first but causes us to not want to look away. With this FB ad, Nerdwallet is sending traffic to a blog post around the 4 best credit cards for low APR and debt consolidation. The image uses the 20% text rule well — including the line “0% APR for 18 months” over an image of a credit card. It’s interesting to note that Nerdwallet is converting traffic through a content article’s affiliate links rather than a credit card search tool. Also, it’s interesting to note the inclusion of the asterisk in the ad. Since Banking is such a regulated industry, there are sometimes compliance issues that get in the way of an ad. Here Paypal cleverly includes the notice in the ad images while not distracting their audience away from the headline. In order to promote their home equity product, Chase runs an ad towards their “are you renovation ready?” quiz. In the ad, they include an image of Jonathan and Drew Scott (from the HGTV show Property Brothers) to encourage fans of the show to click on the ad. It’s also interesting that they set up the ad image to be a diptych — with half showing the renovation stage and one showing a beautifully finished home. A quick note to take away here: people love before & after photos. Wells Fargo gives a strong reason to choose their bank by running a FB ad with actual CD and Savings interest rates. This is a hard ad to run as rates often change — and Wells Fargo acknowledges that — including an expiration date for their offer in the subheadline. Marcus, the new lending arm of Goldman Sachs, uses a Facebook Carousel ad for their lending product. And they use the Carousel product in a clever way — stringing a story step-by-step across multiple frames. E*Trade runs a lot of video Facebook ads these days. This one is an exaggerated commentary on the state of American retirement savings. The video includes a looping music track that you can’t help but stop and watch — over and over again. This Facebook ad is interesting because it includes somewhat hard to read copy. But that’s not always a bad thing! It makes you slow down, carefully read and think through the message. In this case you might read, “Pad Thai For the Pad Fridge” and then be encouraged to read the smaller supporting copy above the concentric circles. Here’s an effective use of the Facebook Carousel ad design. Each screenshot shows a different feature of Clarity Money — to show prospective users what they can expect if they install the app. Then up-top, the ad provides a headline with strong social proof: “Join over 1 million registered users.” That’s a hard statistic to ignore! Mint offers a similar product or service to Clarity, but their advertisement takes a different strategy. Rather than providing a Carousel ad, they opt for a video ad that directly demos their product. Video ads have the added benefit that you can retarget segments that watch a certain percentage of the video. This Betterment ad plays up how their brokerage service is “better” than their competition. Rather than settling for “fine,” Betterment encourages their audience to ask for more from their money manager. The person in the photo — while unidentified — adds a human element to the robot-investment fund. And the CTA on top of the image adds another nudge to click through and see what’s on the other side. The latest Facebook ad campaign from Oscar is targeted at business owners that are considering health insurance providers for their business. This ad features a short, catchy headline that appeals to the main concern of employers: value without high costs. Then, in the subheadline below, this ad directly calls out the audience with a personalized message. It mentions “Learn more about business plans in New Jersey” — making business owners in the Garden State feel as if this was directly created for them. Want to see a great use of using company data to write an ad? Here’s an incredible example from Lemonade! By telling you they get a new customer every 90 seconds, you’re given a bit of social proof. If that many people are already trusting the site for insurance, why shouldn’t you? This is an approach we rarely see — a giant bunch of copy — but it seem to be working for Jetty. In this Facebook ad example, they start listing off reasons why you might want renter’s insurance. By the time you’re 3 or 4 items down the list, you’ve probably started fearing the worst. We’re ready to click as soon as they mention the guitar falling off the wall stand. What item worries you the most? When you’re shopping for credit cards, pre-approval can make all the difference. Credit Karma knows this, and they created an ad that plays on the concept. This ad is for refinancing student debt — but the approach is all around what you’re missing. They show a photo of woman cruising around on a sailboat, stress-free, presumably now that she’s out of debt. Then in the headline below, they match the image with a direct challenge to viewers: live life to the fullest. CommonBond also does a great job of quantifying how much they can save you — $24,000 is some pretty serious moolah. This ad uses an image of items you may find in a home alongside the headline “protect your most loved items in minutes.” It’s a smart juxtaposition, as it makes you think about items in your own home and consider whether you have renter’s insurance in place to protect them. The Zebra is a marketplace for car insurance — and this advertisement positions the product alongside its competition. Note how they use a brighter blue, more copy, larger type, and an orange badge to drive you to look at the right side of the image. You then may notice the lower price for Zebra and honestly be convinced to click and see if you’re getting the lowest rate you could be. This Zenefits ad is short and to the point. At the top of the ad, they outline the products they work with: benefits, payroll, and HR. Then, in the advertisement, they communicate the award they received from PC Mag to give more clout to why you should trust their brand. Acorns has a Facebook ad that uses imagery to get their business model across flawlessly. Their service rounds up every transaction you make and invests the change. And from the video of the coffee cup pointing to the investment app — we can see that in action. It’s a clear message, and it’s powerful. Then to back up why you should trust them, the ad indicates that over 4 million people already trust them — an easy sell at that point. Hubspot is great at integrating content into their marketing funnel. Here’s an example of one of the many ads they use to nurture visitors into eventual customers. Notice how they repeat “Download” in both the image for the Facebook ad and in the subheadline below the ad. The multiple mentions really emphasize that you should take that action. It’s also interesting to note that they keep their URL exposed. The visitor is able to see where on Hubspot’s site they are headed, and if they ever decide to visit in the future, they can visit the same vanity URL. Invision is driving visits to their Enterprise demo registration with this playful ad. We love how they use an illustration of two coworkers working together to get a project done — similar to how you would use their product. The copy above the Facebook ad provides use cases for their product and describes the app as “enterprise-ready.” We also like the copy on the advertisement on the ad itself — ”get to market faster” — is direct and gives a meaningful benefit of Invision’s software. Here’s an ad that we’re currently running on Facebook. In our headline, we emphasize the number of customers that currently use our product (over 5000). Then in the image below, we provide an example of how our Notification displays when installed on a site. In the copy below, we push users with the headline “Get your free Proof trial.” It’s worked well for us, but it’s one of many ads in our arsenal. Want to see a great and easy way for your audience to engage with your Facebook ad? Create a list of items up top but format the list so the viewer has to click “see more” to see the full text. We naturally want to know what we can’t see, and by telling us there are 4 reasons, we naturally want to click to find out (#4 is ✅ Growth Beyond Human Limits in case you were curious). Here’s a great use of the Carousel Facebook from Gusto. There are a few awesome tactics at play with here. Another great tactic here is the use of bright ROYGBIV colors in the background of each image. One phone has a bright yellow background, the other a bright blue… The contrast makes you curious to click through each panel. One benefit of AWS is the ability to build connected home products. This Facebook plays up that benefit and gives just enough information to make you want to click through to the other side. The imagery of the ad is simple — it’s a blue background with logos of potential applications of IoT technology. Then on the side, it incorporates a headline and subheadline that compliment the FB ad text. Are you wasting time stuck in status meetings and never-ending email threads? Rather than using Facebook for direct conversions — Buffer publishes lots of content on their Facebook page. One example is this paid post pushing their audience towards a new marketing podcast download. The podcast focuses on a juicy topic — changes to the Facebook algorithm. The ad starts with a great hook: “Organic reach declining? You’re not alone.” It then introduces how their article can help marketers adjust to the change. Illustrations seem to be all the rage for software companies these days! And it’s for good reason — it adds a bit of humanity and playfulness to an otherwise dry marketing conversation. If that’s not enough to spike your interest, you’re a tough sell. Mixpanel takes a content approach with this advertisement — giving away a free (but gated) report on success strategies used by CMOs. We like this ad because it’s immediately clear the value of clicking, and it’s obvious that we get something of value — in this case, a collection of 10 interviews. The image behind this ad does not add much — other than a fun illustration to accompany company logo. But where this ad succeeds is all in the top headline. That’s a huge benefit — and it’s something that can actually incentivize a person to click and learn more. If you don’t jump into their platform and get started today, chances are you can miss out on something big. On the Carousel ad, they present copy such as “Your website is waiting” and “Your domain is waiting” to make it feel like the only thing missing is you. This ad doesn’t directly identify what CallRail does, so it’s likely being used in a retargeting capacity. It is clear that by clicking the ad, you’ll be able to schedule a “free demo” that’s “personalized” — two major wants of SaaS customers. Here’s an example a great Facebook video ad from the team at Sumo.com. Their cart abandonment software is built explicitly for Shopify stores — and their ad is punched full of value you’ll get out of the product. It’s notable that their Facebook ad includes emojis and an arrow towards the image to make you concentrate on your offer. The headline directly shows the value you’ll get out of the product, and they are keen to note that Sumo comes with a 14-day free trial. We really like the honesty that comes with this ad — it identifies the top reasons people STOP paying for their product. It seems counterintuitive until you realize the mission of the article. They use this piece of content as a way to drive clicks from other SaaS stakeholders that may be searching for Heatmap and Retargeting software. The headline is also very powerful — connecting the 3 reasons with a ⅓ loss in revenue. We’re ready to click — are you? Here’s a lesson that E-commerce companies know well — and that SaaS companies also recognize — use your customers to sell your product. In this ad, Drift shows the noticeable value that a customer received by using their software. They quantify her results (1 million dollars of pipeline) and they pair it with Drift’s results (100,000+ customers). We also really like this ad for their creativity — rather than saying “free trial,” they say test drive Drift’s chatbot. Canva’s ad features a product feature rather than a reason to download the software. With this approach, Canva is showing you what awaits if you start using their service. It’s akin to how car ads show the inside of a nice car — making you constantly think about what could await you when you make the purchase. We really appreciate how this ad uses an image to amplify their message. They show 3 bowls of progressively larger sizes. Then, finally, they provide the message that “no matter where you go or how you grow,” Zendesk scales with you. Leadpages sends traffic from FB to a downloadable piece of content with this advertisement. One great technique at play here is the inclusion of the type of content “[Checklist]” before the headline — giving more weight to what is behind the ad. It also helps the viewer to realize that it’s more than just a typical article. Leadpages also has a keen attention to detail — including the name of the article on a pamphlet on the table in the ad image. Talk about an awesome image. This ad has a graphic that is spot-on for its target audience of growth marketers. They demonstrate a clear inflection point of when OptInMonster caused their business to enter hypergrowth. They then adjust their copy to ask, “Want to instantly boost leads and grow revenue on your site?” Then they go on to quantify the lift their product can push for a brand by introducing a customer case study, Michael from Social Media Examiner. Digital Marketer is known for their content, courses, and fine-tuned funnels. Here’s one of their effective campaigns running on Facebook. So, what are they doing to make you engage with the ad and click? They also make the image for their ad seem like it includes clickable buttons, even though it doesn’t. If you try to click one of the buttons, you’ll inadvertently end up on a Digital Marketer landing page. Another thing they notably control for is making sure you know where you’re landing. Since this ad points to a landing page (doubleyoursales.com) rather than Digital Marketer’s site, it’s identified above the headline. We really like how Sleeknote positions this Facebook video advertisement. They first present a hypothetical, then they give an answer, and finally, they provide a case study to backup their claim. By the time you watch the video, you’re warm to the content, and you’re truly curious how they reached their 10% conversion rate. There are a few great techniques at play in this video ad. At the top, Infusionsoft makes the claim that the average company “saves nearly 50 hours a week” — giving a huge quantifiable value to their software. And finally, they utilize brackets to box off the words: Live Demo. That way, without even clicking their ad, you’re prepared for what you’ll receive on the other side. Shipstation helps solve the integration issues that come with shipping products. This Facebook ad example does a swell job of laying out that message. They include images of well-known brands (UPS, FedEx) on one side and languages (Php, JS) on the other side, and then they visually show ShipEngine in the center as the linkage point. The Headline “Get Started For Free” gives you a reason to click-through, and if you have any hesitation, the line “Join thousands of global merchants” should help meet any hesitation. Why not try something random and out there in your advertising? That’s exactly what ConvertKit does here. It’s weird and out there — but if they’re still running it, it could be working for them! So why not test a moonshot ad for your brand? Yesware’s best Facebook ad teaches their audience a lesson that can be applied with or without their software: Dialing prospects right after they’ve opened your email can result in a 32% higher connect rate. But by giving away that fact, and then immediately offering a solution (the Yesware software), they are presenting their product at the right time and place. Webflow pioneered the idea that it’s possible to build a dynamic, well-designed site without an engineering team. And boy, is there platform powerful! This ad is notable for a few features. Look at how they included a short link to their site at the end of the copy. Depending on the ad — this can increase click-through. And these days, Facebook is able to track those clicks as well. Another interesting feature is the video demonstrating how the actual product works — you can see Webflow in action before even visiting their site. ConversionXL’s ad uses a one-time discount to hook buyers for their class. And what do they do to in this best Facebook ad example? They mention the discounted price (and the fact that it is 80% off) two times in their ad. They also successfully utilize the See More tactic in which a viewer has to click in order to see the remaining text. Here’s an example of an advertisement that does a great job of stringing a message throughout every available field. Trustpilot starts their message up top with “Your customers are feeling…,” and then they finish the sentence in the image below with the copy “joyous” strung into a design that looks like a Trustpilot review. Here’s a tactic to try — if you partner or offer an integration with a partner with a big brand name, why don’t you tell the world? That’s exactly what Sprinklr does here — letting their audience know about their partnership with Microsoft. Clickfunnels makes marketing funnels, and naturally, their best Facebook ads are pretty well-optimized. In this ad, they are marketing a training to entrepreneurs and wantrepreneurs alike. They also capitalize the word FREE to emphasize that value of their class. Salesforce does a lot of their marketing around webinars, content, and resources. By doing so, they don’t have to spend time and money servicing leads that aren’t right for their product. Configure Price Quote (CPQ) is a specific term used in sales, and the custom audience that sees and wants to read this piece of content is likely in Salesforce’s target audience. We like how the ad uses a custom illustration rather than a typical stock photo. This ad does a great job of asking questions that get in the customer’s head. It identifies potential pain points (in question form) and then positions the Demo ad as the solution you need. While this ad still uses a stock photo, by including a blue gradient over the top, they are able to make it a little more interesting and in-line with their branding. Pardot takes a similar content approach to their parent company (Salesforce). On the ad, they do a great job of asking a simple question up top. Then in the image and in the headline below, they show why the Field Guide helps counter that question. Rather than running an ad for a guide or E-book, Appcues funnels their ad traffic to The User Onboarding Academy. We really like this approach because while the academy is free, it seems like it’s full of a ton of value: 5 comprehensive lessons and 1 proven framework. The ad also does a great job of including logos from other big brands that marketers (their market) trust. If Zapier, Adobe, and Mailchimp all have gone through it, why not give it a try? We like this ad for the value prop that BigCommerce proposes in the supporting copy. Up top, they provide 3 of their big value props, and then below, they have carousel Facebook ads that funnel towards certain pages. This Moz ad does a great job of showing their product as the “one stop solution” for SEO. In their ad, they emphasize that their trial is both free and 30 days long. HelloSign uses this ad to recruit engineers to apply to roles at their company. They point the traffic towards their jobs page, and they try to show fun-loving and driven coworkers you’d be surrounded by if you joined their team. This ad from Dialpad does a great job of visually showing the integrations that their app. They surround the Dialpad logo with the logos of other well-known tech brands — Salesforce, Gmail, Slack, Zendesk, Dropbox, and Drive — to elevate themselves. Then below, the copy “Connect Everyone, Work Everywhere” brings it all back together. Trustpilot has one of the most clever ad series we’ve seen on Facebook. They make the image for the ad the same as their review product. The support copy is simple: “your customers are feeling:” and then they run different iterations of the ad with words from annoyed (1 star) to joyous (5 star). A smart and scalable solution. Sponsored content on media sites is nothing new — but here’s an example from the team at Vox. At the top, they provide a short summary of the article to tease you to click. Then, in a move that’s appreciated by many consumers, especially post Cambridge Analytica — they call out the post is sponsored, and they tag the sponsor, The Gates Foundation. Honestly, we’re more inclined to click due to Vox’s honesty in the ad. The team at the NYTimes are experts at getting clicks to their site. Here’s an example of one of the ad formats they publish many times a day. Up top, they give a two-line summary of the article to hook a reader. Then they use a headline — either the same as the article or a variation — to get you to click and read on their site. With a similar reputation to the NYTimes, the Wall Street Journal also does content promotion well. They run ads towards well-performing content with quick, hooking summaries up top, and a well-tested CTA below. Mic started as PolicyMic, covering government and policy. Since then, they’ve updated to cover a wide array of topics including music and culture. The copy here is interesting — claiming “she has a thing or two to say” — but not mentioning what. That’s enough to drive many viewers to the site. Buzzfeed has built up paid partnerships over the past few years — and here’s a prime example. In this FB ad, they are promoting Course Hero — a tutoring and study site. The answer is likely yes, especially if they’ve ventured to Buzzfeed rather than opening a book. Once the ad has started playing, the viewer is on the path to converting. But on further review, you’ll notice that the brand mentions the Miele dishwasher in the text above. It’s a sponsored post, but it’s subtle enough and seemingly-quality that an audience member should give it a click. As a fashion magazine, GQ does an incredible job of maintaining their design aesthetic across all touch points on their brand — from their site to their emails, and yes, even to their Facebook posts. This ad is a great example of a typical GQ co-sponsored post. They lead with a great hook (and on first glance, this looks like a completely organic play). But on further review, you’ll notice the subtle note (with Audi USA). Overall, it’s a well-done execution on sponsored content. In an effort to gain more college subscribers, the Washington Post runs this sponsored ad to an audience of college students. The ad is simple — but they employ a few techniques you could try out. First, they include a white button on their ad that says “View offer.” It can pull you in and make you want to click the button, even the button itself is nonfunctional. The WSJ also does a great job of positioning their offer. They show a crossed off $10, replaced with $5. They also mention Save 50% in both their headline and subheadline. As a publisher, Mashable can earn some extra revenue by writing about certain products. Because they can make affiliate commission on their article, they can also justify putting some ad spend behind it. Here’s an audience development play from the team at NPR. With this ad, they’re trying to get subscribers for their morning podcast: Up First. This ad is really interesting because it’s close to breaking the 20% text rule on Facebook. But since the logo includes text and the ad is for public radio, looks like they got a break. Worth trying out bigger copy on your ad. What’s the worst that could happen? If it doesn’t make it through Facebook’s review process, you can always submit another ad. When running an advertisement for an ad or mobile experience, sometimes it pays to display the device so a customer can imagine how they’ll experience your product. That’s what Bloomberg does with this advertisement. They display Bloomberg on a phone — showing that you can watch their 24-hour coverage on the go, around the globe. Here’s an example of how a network can run sponsored content in sync with a brand. In this CNBC sponsored content, the network is very upfront about this being an ad with Synchrony — even including #ad in the copy. As consumers, we appreciate their honesty. At first glance, this ad from Inc Magazine does not look like sponsored content. But then when you click through to the article, you see that it actually is a guest post from the team at Quora. Sneaky move! TechCrunch hosts a whole lot of events — and they use Facebook ads as a channel to sell tickets. This ad has two ways that it tries to get you to act quickly: 1) it mentions how the current pricing is about to go up 2) It mentions how tickets are currently 50% off. The Huffington Post is actively running a Facebook ad campaign for downloads of their midterms election app. We like how the ad image of the Capitol building is on-brand with the copy and mission of the Huffington Post. We also appreciate how the overlaid text is clear to read on the ad — and utilizes red and blue text to symbolize the election season. NBC is running this Facebook ad to get signups for their morning Rundown newsletter. It employs a novel technique — using the NBC logo as a mask for the image behind it. This is a nifty trick to get around some of the Facebook rules around images in texts. NBC has a recognizable enough logo that this works — but it might not perform as well for a brand with a less identifiable logo. With this ad, Fox is aiming to get downloads of their app. They acutely realize the power of showing the device in a human hand — without even reading the text, you understand that the app allows you to watch Fox news on your phone. CNN also tries to get subscriptions to their daily email here. They use their star host and easily recognizable celebrity, Anderson Cooper, to get viewers intrigued to click more. Not a bad tactic to employ if you have a celebrity at your disposal. Here’s an ad that you rarely see — the whole image is just a price. It’s a tease by USA Today to make you click and learn more. By making the price the center of the ad, you’re intrigued to find out why you are seeing that price. Funny or Die is known for their hysterical video shorts. This sponsored collaboration with Old El Paso Tortilla bowls shows how a brand can still knock out quality content and monetize it without angering an audience. Well done! Bill Simmons fans know the Ringer well — a site that combines a healthy mix of humor and sports. This ad for the media outlet has a particularly notable approach. They tag the athletes they mention in the video which helps increase the reach of the post and makes fans of each player stop a little longer. Again we reiterate: if your content deals with a celebrity or notable company, it’s worth tagging them. Gimlet is a podcast network — and their approach to advertising on Facebook is more of giving potential listeners a behind the scenes view of their show. This ad shows photos of Alex Blumberg, Gimlet’s founder and host, interviewing a guest for a new show. The ad is human, conversational, and makes you want to check out the podcast if anything in the copy seems interesting to you. This limited time offer advertisement for the Economist plays on pricing. First, it mentions that the offer is only valid for a “Limited time.” Then, it continues and adds a free item to the mix, an Economist notebook. Finally, it plays on pricing as a $1 per week for 12 weeks rather than $12 for 3 months. Smart positioning by their team. Think about how you can alternatively structure your pricing in an ad! This ad for Entrepreneur pushes the audience towards an article by mentioning an app. By reading the copy, you’re likely intrigued, and curious about what they could be talking about. You click through to the page, and you’ll see a sponsored post. These are some of the best Facebook ads ever — do you have any that you think we should add to the list? We hope you’re inspired to launch some new campaigns and get your CPA down. 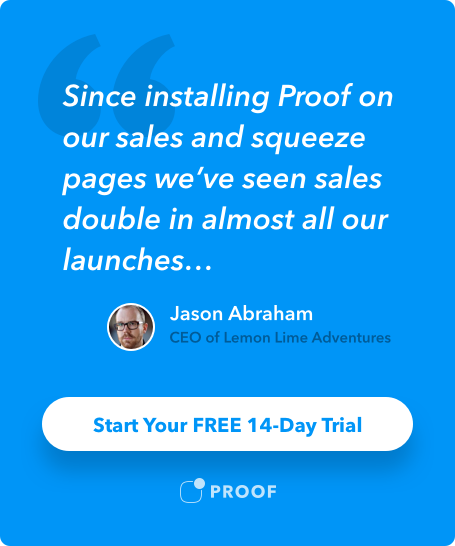 If you’re looking for a tool to help you increase the conversion rate on your pages, and consequently lower your CPAs, take a look at Proof’s software. Over 15,000 websites trust our software to see a 10-15% lift in conversions.